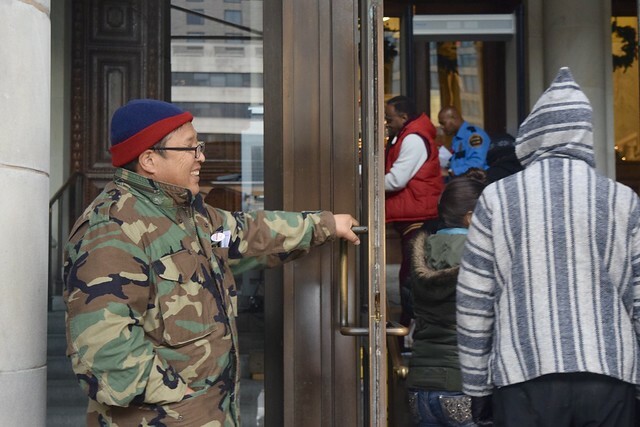 Demonstrators stayed out overnight and started the morning off with prayer and breakfast before storming city hall. There they presented demands to fully fund Homeward DC, the District’s 5-year plan to end homelessness. Day two of the annual National Homeless Persons’ Memorial Day Vigil had kicked off at Freedom Plaza with a teach-in led by Monica Kamen. The teach-in was held to educate people experiencing homelessness on where D.C.’s money is being spent. The District spends the majority of its budget on human support seravices such as hospitals, social services, healthcare, and the food stamp program. 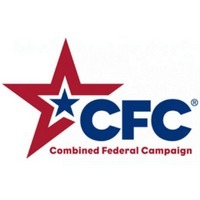 Kamen, an advocacy coordinator for the Fair Budget Coalition, stated that there is a total of $13 billion in the city’s budget, but D.C. only spent $223 million on housing and homeless services. A total of 53 people who died on the streets in 2015 were recognized at the memorial service that afternoon (names listed below). “Jane Doe” and “John Doe” were included on that list, to signify those names not collected. Some persons go unreported to the advocacy community by those they left behind. Others go unnoticed. As of December 11, there were a total of 110 District “public disposition” cases in 2015, according to a Freedom of Information Act Request filed with the Office of the Chief Medical Examiner (OCME). Public disposition refers to cases where a persons’ remains go unclaimed after a period of 30 days. As clarified by the OCME, public disposition is not necessarily synonymous with homelessness. 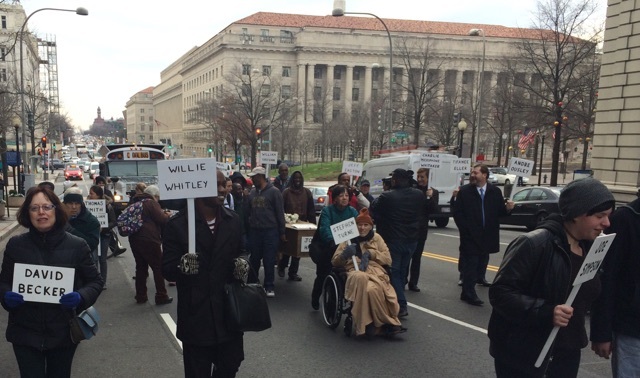 After the teach-in wrapped up, demonstrators headed to the Wilson Building and delivered roses to the office of each of the council member and to confirm their support of Homeward DC. The 5-year plan envisions that no one will spend more than 60 days on the streets. It contains different milestones before 2020, such as ending chronic homelessness by 2017. The city is narrowly missing its first milestone: ending veteran homelessness in 2015. According to a December 10 report released by The Way Home Campaign, there are only 213 homeless veterans left in the District. Demonstrator Orock Ojong thinks that Homeward D.C. is a great idea, but said “2020 is too far away because in the winter we lose people.” She says that ending homelessness should be a top priority in D.C. because people’s lives matter. 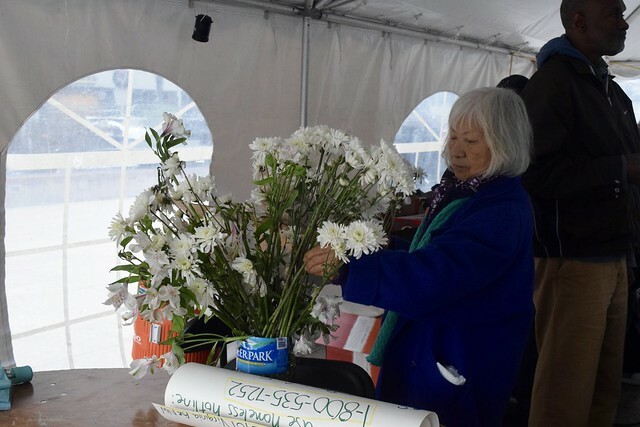 The roses delivered to city council represented the lost lives of the homeless men and women honored in the 2015 vigil. 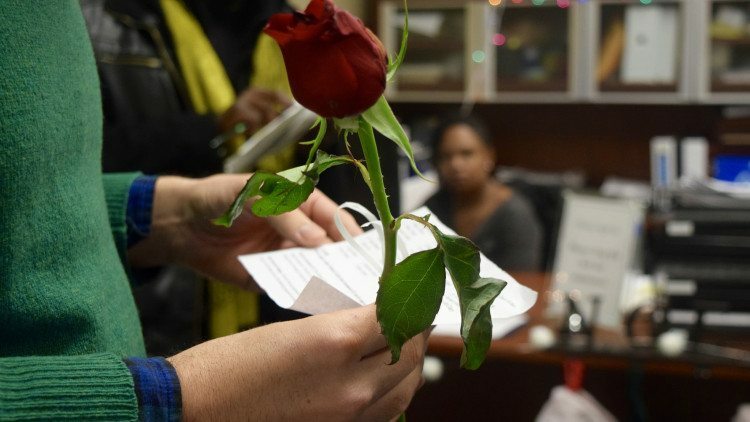 The first rose going was left for Ward 5 Councilmember Kenyan McDuffie, who was not in his office. But the group was able to speak with Shawn Hilgendorf, who said that the council member looks forward to requests from the advocates in 2016. 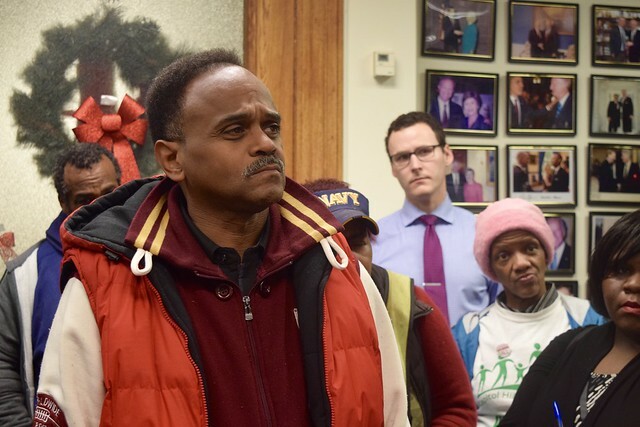 People for Fairness Coalition co-founder Albert Townsend stressed that the group wanted to make sure that McDuffie’s office also looked forward to fully funding the Homeward DC. Grosso later processed with the advocates to the afternoon memorial service. 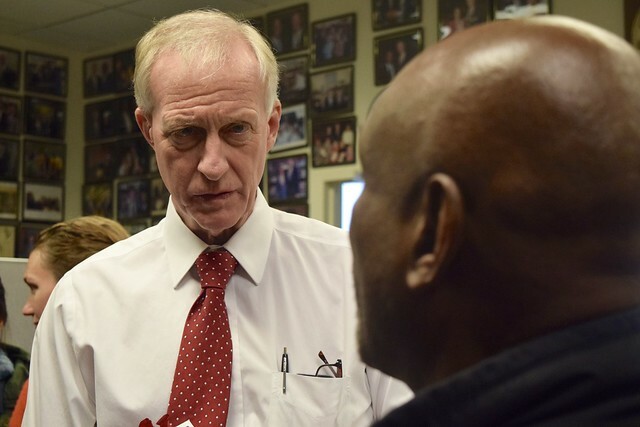 Next came Ward 2 Councilmember Jack Evans’ office. A particular issue of concern while meeting with Councilmember Evans were the Mayor Bowser’s recent homeless encampment sweeps. Evans’ ward has been at the forefront of the closures. An estimated 40 people had battled with both neighbors and city officials to maintain a place they called home under the Whitehurst Freeway, near the Watergate complex. That area is now completely fenced off. According to Albert Townsend, closing an area that folks call home scatters them and destroys their sense of community. “Councilmember Evans, it is scary to be homeless,” said Jesse Rabinowitz, an advocacy specialist at Miriam’s Kitchen. Rabinowitz had discussed the encampment sweeps in detail during the morning teach-in. Many people staying outside are afraid to go into the shelters. Then the sweeps take away the only shelter that they have. The homeless are kicked off the streets and their personal belongings like identification cards and any little money that they have are thrown away, according to Rabinowitz. “Tents save lives,” he had said to the morning crowd. People who are living outside have a lot of issues according to Evans, who believes living under a bridge is not a great idea. 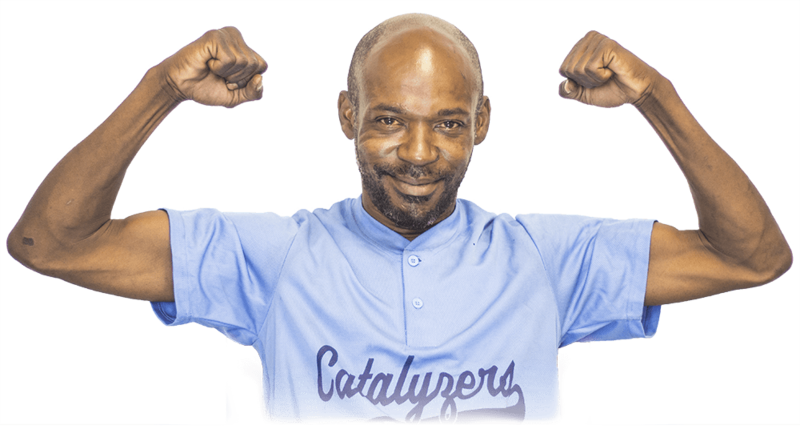 Nevertheless, he agreed to work toward an end of Deputy Mayor for Health and Human Services Brenda Donald’s encampment sweeps. The advocates asked Evans to send a letter to the deputy mayor about this issue. “I don’t have to send a letter, I’ll go and see her,” Evans replied. He also highlighted the need for a downtown service center in Ward 2 for people experiencing homelessness, but didn’t have any suggestions ready to move this project forward. The demonstrators left Evans’ office and split into two groups to save time. One group visited At-large Councilmember Anita Bonds, the other went to the mayor’s office. 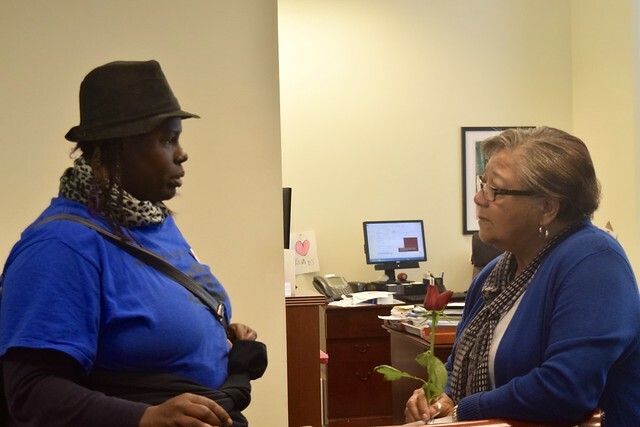 Mayor Bowser was not in her office at the time, but the advocates met in the hallway with Gregory Jackson Jr., Director of the Mayor’s Office of Community Relations and Services. “The encampment sweeps we are seeing are housing the most visible, not the most vulnerable,” said Kyla Dixon, another Miriam’s Kitchen advocacy specialist, while meeting with Jackson. Jackson asked each person to leave their contact information to arrange a meeting with the Mayor at a later time. She believes the community needs to work on sensitizing people to homelessness, and assured the advocates that she supports fully funding the 5-year plan. “You won’t lose a dime,” Bonds said. “We are people and we are all the same,” Bonds said. 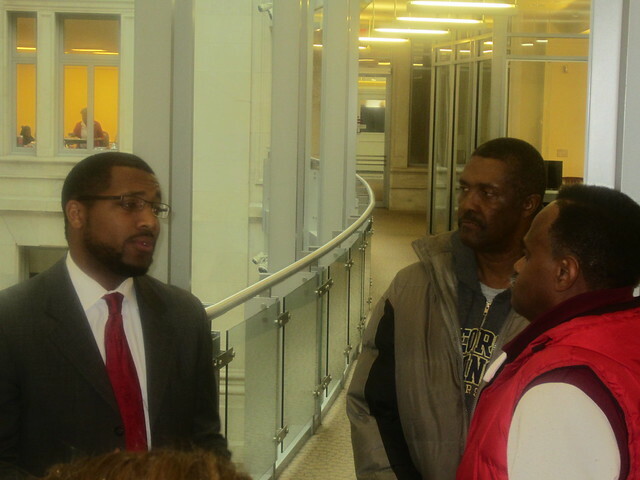 The group next visited Ward 3 Councilmember Mary Cheh’s office and was able to speak with her legislative counsel. “I thought there was a protocol?” Anthony J. Catalina asked when advocates brought up the removal of the Whitehurst Freeway residents. The demonstrators indicated that they had witnessed the encampment protocol, which was developed by the deputy mayor in August, not being followed. The protocol includes a stipulation for not taking away items that may save a life from people in encampments. “We’ve got a long way to go,” Catalina said, urging the group to continue its efforts and make regular visits to the council. He said that Cheh’s office is also looking into the issues of public restrooms. 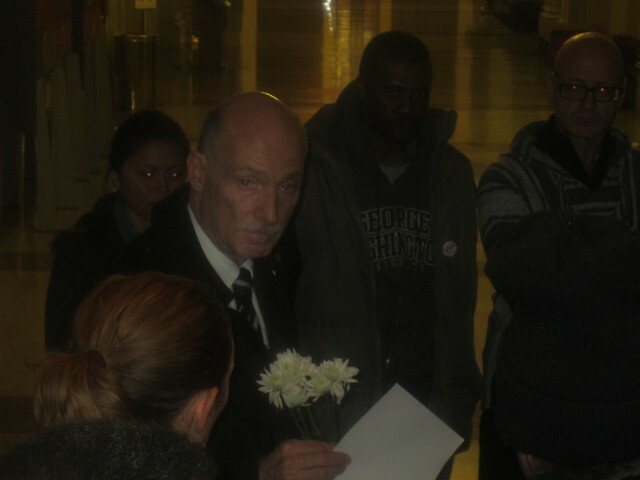 Demonstrators then ran into Council Chairman Phil Mendelson in the hall as he headed to his office. Once the roses were distributed, demonstrators marched to New York Avenue Presbyterian Church. After a brief lunch, the overnight vigil culminated in a memorial service that began with a special prayer for the 42 District residents, 11 northern Virginia residents, and countless unnamed persons who died while experiencing homelessness in 2015, and for those who are still alive out on the streets. Tadesse Dinku gave a short reflection on his life as a torture survivor. “I was tortured in Ethiopia for ten days because I opposed the ruling party there,” Pinka, who was subsequently homeless in D.C., said. “Now I am in a survivors’ house. I have my own bed and share friendship with other men.” Next was Rev. Ashley Goff of Church of the Pilgrim, who said that “everyone deserves to be called by name” and that is one of the reasons for having the vigil. Matthew Doherty, Executive Director of the U.S. Interagency Council on Homelessness, said that people experiencing homelessness need housing that will provide safety and a permanent home in our neighborhood. 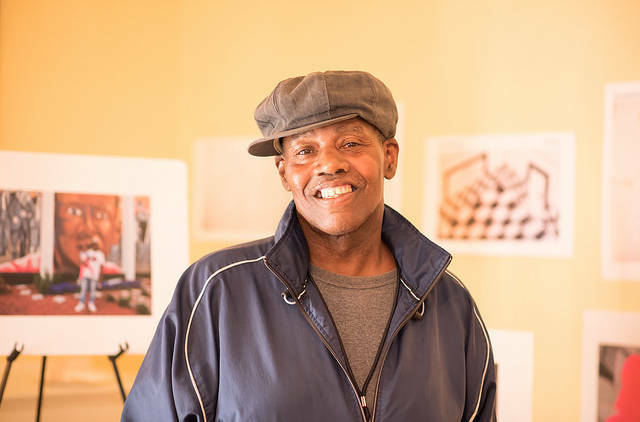 The memorial service was extra momentous because it was the first time anyone has seen long-time advocate and community organizer for the National Coalition of the Homeless Michael Stoops. Earlier this year Stoops suffered a severe stroke that left him virtually incapacitated. 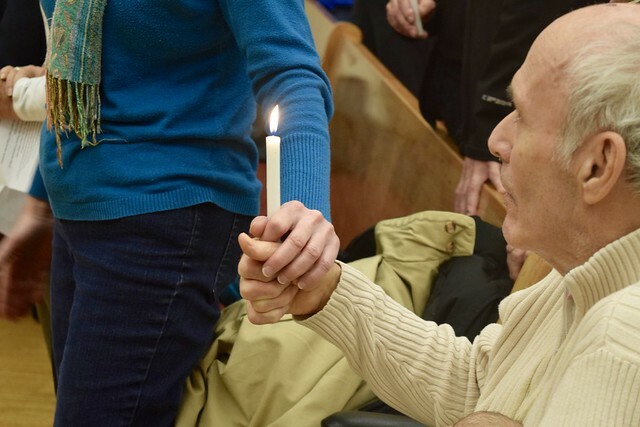 Patty Fugere, Julie Turner, Michael Stoops and other memorial service attendees hold lighted candles to remember the lives of men and women who died while experiencing homelessness in 2015. | Photo by Ken Martin. Today Stoops participated in the marches and memorial service in his wheelchair. 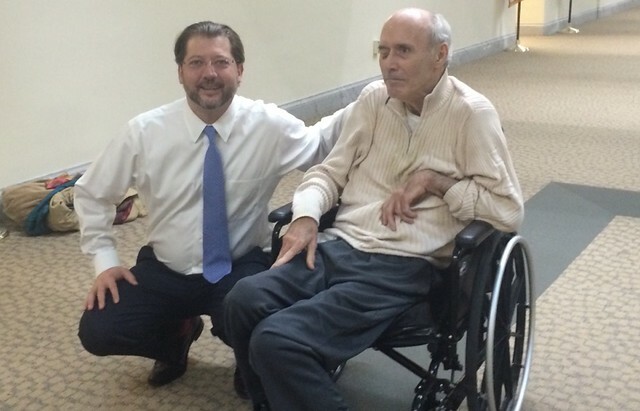 He could share a meal and communicate, which were welcome signs of his recovery for those gathered at the service. The ceremony ended with the lighting of candles in memory of the 53 District and Northern Virginia residents who passed away unhoused in 2015. 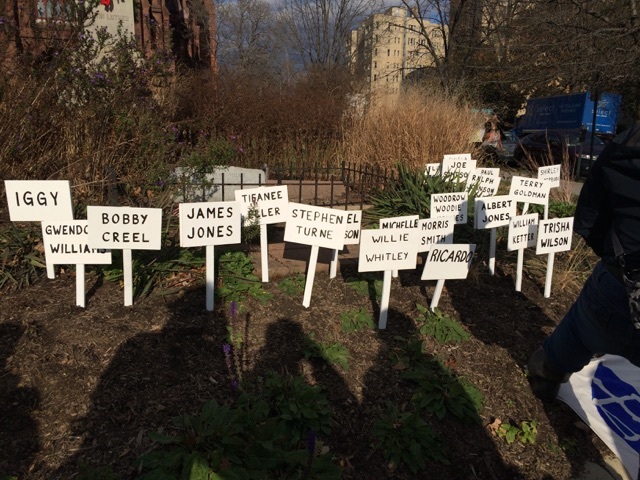 The core demonstrators then ended the day by laying the placards bearing names of those who had died to rest at the symbolic grave of historic homeless advocate Mitch Snyder. 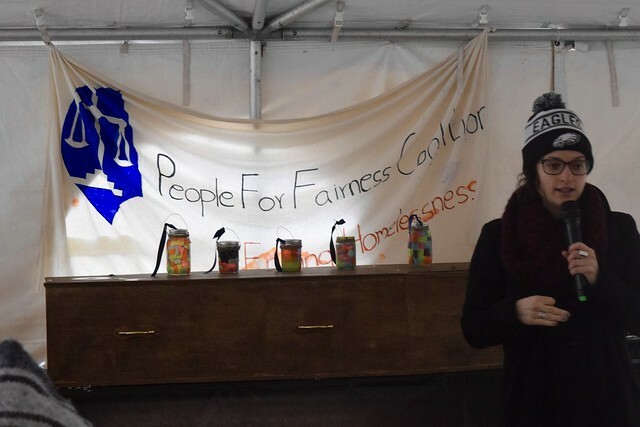 This year marked the third year the People for Fairness Coalition has marched for those who have passed “without the dignity of a home.” It was the hope of everyone in attendance that someday, deaths of people experiencing homelessness will end once and for all.